Forensic disciplines arose out of crime scene investigations, and law enforcement’s search for compelling evidence to convict. In this unusual development, forensic results were not tested in a lab but rather in the field. Their reliability and importance were indicated by the rate of convictions for crimes not by impartial scientific assessments. 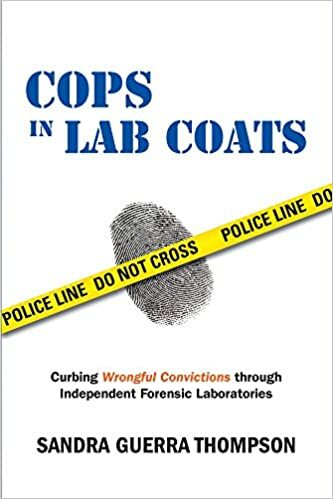 Given the intimate—indeed integral—association between forensics and law enforcement, “crime labs” have been influenced by cognitive bias, confirmation bias, and by an impetus to create results for the prosecution, and not for the impartial search and study of science. Thompson discusses cognitive bias by analysts being police department employees, including departmental pressures from being subordinate to the Chief of Police. (Pp. 130-131.) This slant has led to the widespread use of ambiguous evidence in the race to convict individuals, including innocent men and women. Thompson’s inclusion of wrongful convictions mirrors the national conversation where innocence is the primary impetus to ensure that forensic disciplines become more reliable, forensic findings more testable, and forensic inquiries more independent. Notwithstanding the resistance to wresting labs from police control that Thompson details (p. 183-187), the NAS report’s overall goals regarding forensic reform are increasingly within reach. Crime labs are adopting more rigorous protocols, federal oversight is growing, and federal funding supports greater research. Indeed, the National Institute of Standards and Technology (NIST) hosted the first ever scientific conference on crime lab error management in 2015, an impressive step forward given that many forensic scientists would have been ashamed to admit crime lab error just a few years ago. In short, the question is no longer whether, or how, but how soon we can learn more and strengthen these disciplines. Despite the advancement in forensic disciplines and research, a significant obstruction remains to restoring reliability in our criminal justice system: the courts. Judges, defense attorneys, and prosecutors continue to misuse, mishandle, and misrepresent forensic findings with impunity. (Pp. 109-115.) Unfortunately, the wave of reform attendant to the forensic sciences seems to have eluded lawyers. Cops in Lab Coats challenges our legal community to do what the forensic community has already done: wake up and take notice of the significant problems and responsibilities attendant to the non-surgical use of forensics in the courtroom. For a full draft of the book review, including a broader discussion of the recent history of forensic science, how forensic faults have contributed to wrongful convictions, and the role of the judiciary, click here. Readers interested in this book might also find Failed Evidence: Why Law Enforcement Resists Science worth a read. It is by David A. Harris. Not only should crime labs be independent, but perhaps the scientific method should be enacted by statute to help ensure accuracy.